A dining table for two. Furniture is the term used for a class of movable objects that may support the human body (as for seating or sleeping), provide storage, or hold objects on horizontal surfaces above the ground. Storage furniture (often equipped with drawers, shelves, and doors) is used to hold or contain smaller objects such as clothes, tools, books, and household goods. Furniture can be made from many materials, including metal, plastic, and wood. In addition to its functional role, furniture is considered a form of decorative art and can be the product of artistic design. It may also serve a symbolic or religious purpose. In conjunction with furnishings such as clocks and lighting, domestic furniture works to create comfortable and convenient interior spaces. Furniture has been a part of the human experience since the development of non-nomadic cultures. Evidence of furniture survives from the Neolithic Period and later in antiquity in the form of paintings, such as the wall Murals discovered at Pompeii; sculpture, and examples have been excavated in Egypt and found in tombs in Ghiordes, in modern day Turkey. Skara Brae house in Orkney, Scotland, is evidence of home furnishings, i.e. a dresser containing shelves. A range of unique stone furniture has been excavated in Skara Brae a Neolithic village, located in Orkney, Scotland. The site dates from 3100-2500 B.C.E., and, due to a shortage of wood in Orkney, the people of Skara Brae were forced to build with stone, a readily available material that could be worked easily and turned into items for use within the household. Each house shows a high degree of sophistication and was equipped with an extensive assortment of stone furniture, ranging from cupboards, dressers and beds to shelves, stone seats and limpet tanks. The stone dressers were regarded as the most important as it symbolically faces the entrance in each house and is therefore the first item seen when entering, perhaps displaying symbolic objects, including decorative artwork such as several Neolithic Carved Stone Balls also found at the site. Early furniture has been excavated from the eighth-century B.C.E., Phrygian tumulus, the Midas Mound, in Gordion, Turkey. Pieces found here include tables and inlaid serving stands. There are also surviving works from the ninth/eighth century B.C.E. Assyrian palace of Nimrud. The earliest surviving carpet, the Pazyryk Carpet was discovered in a frozen tomb in Siberia and has been dated between the sixth and third century B.C.E. Recovered ancient Egyptian furniture includes a third millennium B.C.E. bed discovered in the Tarkhan Tomb, a c. 2550 B.C.E. gilded set from the tomb of Queen Hetepheres, and a c. 1550 B.C.E. stool from Thebes. Ancient Greek furniture design beginning in the second millennium B.C.E., including beds and the klismos chair, is preserved not only by extant works, but by images on Greek vases. The 1738 and 1748 excavations of Herculaneum and Pompeii introduced Roman furniture, preserved in the ashes of the 79 C.E. eruption of Vesuvius, to the eighteenth century. The furniture of the Middle Ages was usually heavy, oak, and ornamented with carved designs. Along with the other arts, the Italian Renaissance of the fourteenth and fifteenth century marked a rebirth in design, often inspired by the Greco-Roman tradition. A similar explosion of design, and renaissance of culture in general, occurred in Northern Europe, starting in the fifteenth century. The seventeenth century, in both Southern and Northern Europe, was characterized by opulent, often gilded Baroque designs that frequently incorporated a profusion of vegetal and scrolling ornament. Starting in the eighteenth century, furniture designs began to develop more rapidly. Although there were some styles that belonged primarily to one nation, such as Palladianism in Great Britain, others, such as the Rococo and Neoclassicism were perpetuated throughout Western Europe. The nineteenth century is usually defined by concurrent revival styles, including Gothic, Neoclassicism, Rococo, and the Eastlake Movement. The design reforms of the late century introduced the Aesthetic movement and the Arts and Crafts movement. Art Nouveau was influenced by both these movements. The first three-quarters of the twentieth century are often seen as the march towards Modernism. Art Deco, De Stijl, Bauhaus, Wiener Werkstätte, and Vienna Secession designers all worked to some degree within the Modernist idiom. Postmodern design, intersecting the Pop art movement, gained steam in the 1960s and ‘70s, promoted in the ‘80s by groups such as the Italian-based Memphis movement. Transitional furniture is intended to fill a place between Traditional and Modern tastes. Asian furniture has a quite distinct history. The traditions out of Pakistan, China, India, and Japan are some of the best known, but places such as Korea, Mongolia, and the countries of South East Asia have unique facets of their own. Traditional Japanese furniture is well-known for its minimalist style, extensive use of wood, high-quality craftsmanship and reliance on wood grain instead of painting or thick lacquer. Japanese chests are known as Tansu, and are some of the most sought-after of Japanese antiques. The antiques available generally date back to the Tokugawa era. Chinese furniture is traditionally better known for more ornate pieces. The use of uncarved wood and bamboo and the use of heavy lacquers are well-known Chinese styles. It is worth noting that China has an incredibly rich and diverse history, and its architecture, religion, furniture and culture in general can vary widely from one dynasty to the next. Some common types of furniture are noted below. Bed: A bed is a piece of furniture used primarily for sleeping. Different types of beds are available for use under different sets of circumstances. For example, a bunk bed consists of two or more beds, stacked one atop the other. A cot is a portable bed. A crib is a bed for babies and infants. A futon is a traditional Japanese-style bed. A Murphy bed hinges into a wall or cabinet and helps save space. A roll-away bed is a bed on wheels that can be folded in half for easy moving and storage. A sofabed is one that is stored in a sofa. A waterbed is one with a mattress that is filled with water. Bookcase: A bookcase (or bookshelf) is a piece of furniture with horizontal shelves, used to store books. Cabinet: A cabinet is usually a box-shaped structure, either standing alone as a piece of furniture or built into or attached to a wall (such as a medicine cabinet). Made of wood or synthetic materials, it is used for storing miscellaneous items. A cabinet usually has one or more doors on the front, occasionally with a lock, and it may also contain drawers. Chair: A chair is a type of furniture intended for sitting, usually for one person at a time. It consists of a seat, legs (usually four) that support the seat, a back, and sometimes armrests. Without the back and armrests, it is called a stool. If it has a reclining back and an inclining footrest, it is called a recliner. A chair for more than one person is a couch, sofa, settee, loveseat, or bench. A separate footrest for a chair is known as an ottoman, hassock, or pouffe. A chair mounted in a vehicle or in a theater is simply called a seat. Chairs as furniture typically can be moved. Hatstand: A hatstand (or hall rack) is a type of furniture used for the storage of hats, coats, and umbrellas. Typically, it consists of a single pole supported by a sturdy base and a number of pegs at the top. Table: A table consists of a surface supported by a base, usually four legs. It is often used to hold objects or food at a convenient height when a person is sitting. 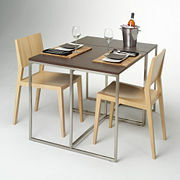 Generic tables are typically meant for combined use with chairs. There are different types of tables. For example, a desk is a table intended for writing or working, and it often has drawers. A drawing table usually has a top that can be tilted and is used to produce large or technical drawings. A coffee table is a low table usually placed in a living room in front of a sofa, and it is used for the placement of drinks, books, and other personal items. Some tables have hinged extensions of the table top called drop leaves, while others can be extended with removable sections called leaves. Wardrobe: A wardrobe (also called an armoire) is a standing closet used for storing clothes. ↑ Stone Age Building: Skara Brae missglen.net. Retrieved September 23, 2008. Le Garde-meuble (Digital Exhibition of an influential French furniture magazine.) Smithsonian Institution Libraries. This page was last modified on 16 May 2017, at 19:11.